If you have been reading my blog, you will know that I had a run in with the squirrels in my garden. It was totally heartbreaking for me to see the damage they did to my gorgeous tomatoes that were just about ready to pick. 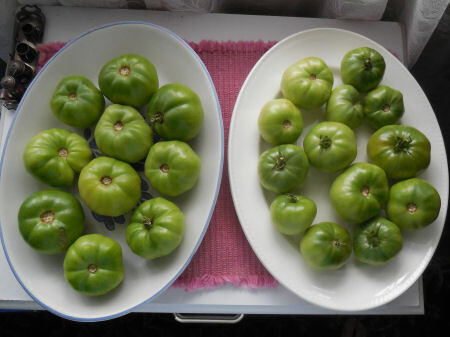 I had to figure a way to save my crop quickly so I decided to ripen green tomatoes indoors.. Even though not all green tomatoes are unripe red ones, in my case, this was true. The squirrels pretty much ruined my corn patch and have decimated the tomato plants too. I had 18 tomato plants and they discovered them all by taking a bite out of each tomato that was anywhere near ripe and discarding it nearby before going on to the next one. Thankfully, most of mine have ripened as the weeks have gone on. They did not get spread out until October as I would have liked but at least I did not lose them all to the squirrels. 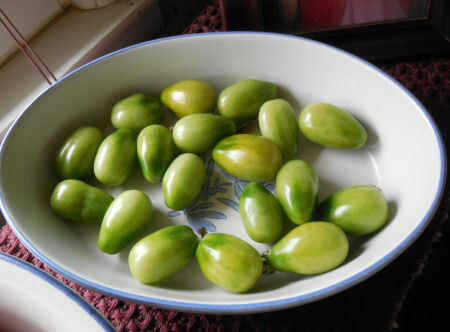 It is easy to ripen green tomatoes indoors. Is it difficult to get tomatoes that are green to ripen off the vine? Not at all! Do you have sacrifice the whole tomato plant to get some ripe ones? No, again. 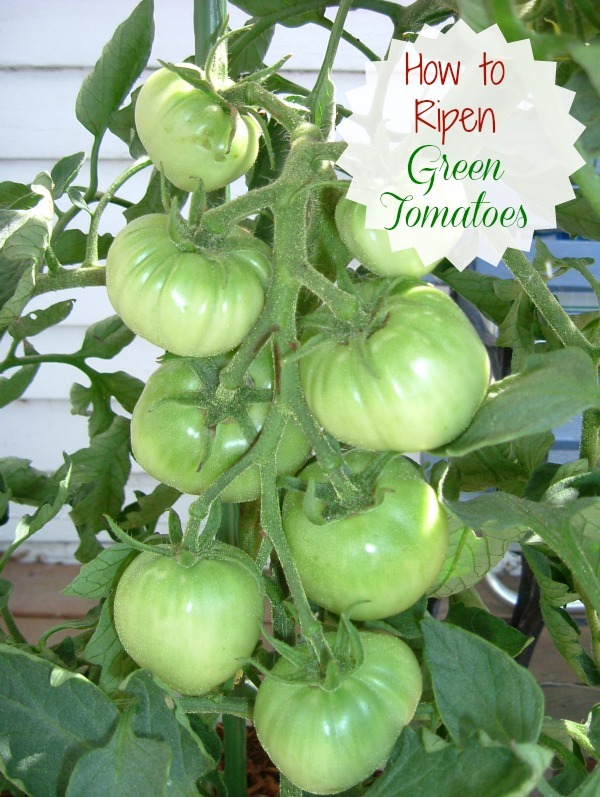 Are there special steps that you have to do to get the green tomatoes to ripen? No, it is easy. Are there specific temperature or humidity requirements to ripen tomatoes? Nope. I just kept transferring the greenest ones to the next spot in the chain with light as soon as I saw some red happening. So far, all but 7 of mine have fully ripened. And I ‘m sure the stragglers will ripen soon. But I’m a lazy gardener. I just hope for the best. I like to set and forget if I can. Here are a few other tips for greater success. Sit the tomatoes with their blossom side down, so they will be less likely to rot. 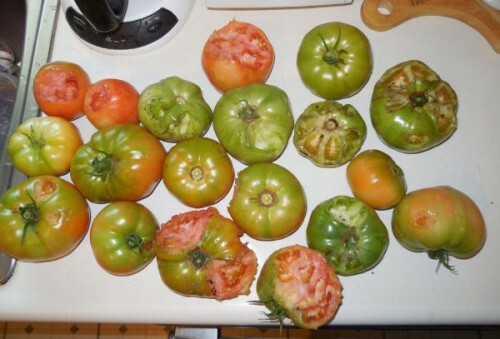 Some of my set and forget tomatoes got a bit TOO ripe. Wrap individual green tomatoes in newspaper and layer them in a box, no more than 2 layers deep. Put the box in a dark and dry spot and check them weekly for ripening. This normally takes 3-4 weeks. Be sure to remove any signs of fruit that show rotting. Another way to ripen is to place the green tomatoes in a bad with a ripe apple. Since the apple gives off ethylene gas, it will speed up the ripening. Check them daily. If it is the end of the growing season, cut off vines with tomatoes still attached and hang the whole plant upside down in a dark and cool garage or basement to allow the fruit to ripen gradually. What other things have you done to ripen green tomatoes? Here are a couple of platters of mine which ripened after about 7 days. I think I will have a 100% green to red rate by the time they are done, and some of them were VERY green and hard to begin with. I did not notice any loss of sweetness. The tomatoes we are eating now are very sweet and juicy. Much the same as those that ripened in the garden before the squirrels got to them. And they tasted good too! 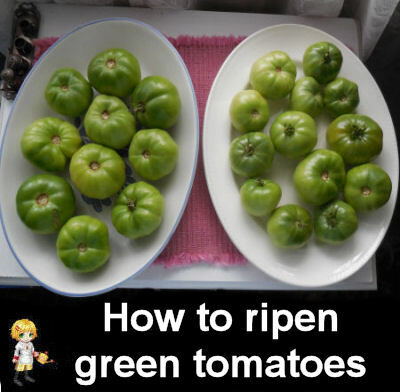 If you want to ripen green tomatoes before you bring them indoors, try this tip submitted to me from Graham Hall in the UK. 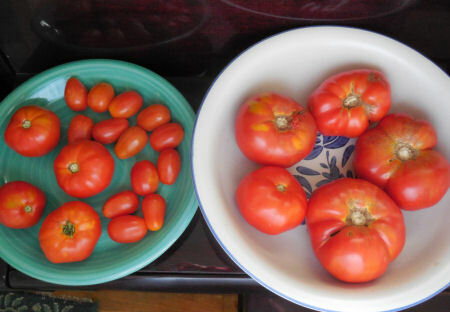 Graham suggests to remove all leaves from plant so that all of the plant’s energy will go into ripening the tomatoes. He says “Drastic, I know but it works. !” Thanks for the tip Graham! Some great ideas on here, thanks for sharing them.